Survey: Improve RSF’s internet service BY KAREN BILLING Residents felt free to express themselves on a recent internet service survey conducted by the Rancho Santa Fe Association Technology Committee, many requesting that the Association get up to speed and bring faster internet to the Covenant to allow for a better quality of life. ■ See inside for a variety of photos of community events. FOR MORE INFO SEE PAGE A5! A portion of Paseo Delicias was closed Dec. 3 when deputies were called for reports of a person yelling and breaking things. initiation fee of $3,750, plus monthly dues that vary for family or single memberships. Van Den Berg said the sponsored members contribute $65,000 to the bottom line and also contribute about $20,000 to charitable donations within the club. In June, the previous RSF Association board split on renewing the category in a 3-3 vote, with directors Ann Boon, Heather Slosar and Licosati voting against it and Eggleston not present for the vote With the new board seated in July, the category passed 5-1 with Licosati voting against it (then-director Boon was not present). The approval was for the program to be annual, with a renewal again in June 2017 – this latest vote makes it a three-year program rather than an annual renewal. The RSF Association board has the right to terminate the memberships and if they are terminated, the members are entitled to remain a sponsored member for two full fiscal years following the notice of termination. Van Den Berg said the club has the ability to have over 300 memberships and had 340 members at its peak about 15 years ago — they have 224 members right now so there is room to grow and the sponsored memberships do not have an impact on the club’s court usage. Views, Privacy, & Ultra Luxe Amenities, 10+ car garage for the CAR ENTHUSIAST Loddon Barn & EQUESTRAIN set-up with Tack, Ofﬁce, Wash, Hay storage & Arena. Stunning Custom, VIEW Estate with 4+ spacious suites in Main home & 2BR Detached Guest Home w/full kit. Well Water available. ***Previously listed at $11M!! *** Sellers are Motivated! Tucked perfectly at the end of a cul-de-sac is this custom home in the premier gated community. The light-ﬁlled home is elevated to enjoy beautiful vistas and ideal southwest. 5 bedroom suites with a beautiful master suite, resort pool and spa. Pristine move-in condition! Beautiful custom detailing & unbelievable ﬁnish quality. The all one-level ﬂoor plan features incredible natural light throughout, 4 luxurious bedroom suites, a bonus/kid’s play room, impressive ofﬁce w/gorgeous built-ins, a chef’s kitchen opening to the great room & dining area, & a secluded master retreat w/separate reading room & spa bath. The home is built around a charming entry courtyard lined with a cozy ﬁreplace & multiple areas to sit & relax or dine al-fresco. On 3 serene, fenced & gated acres with room for the whole family. Sophisticated charm & open ﬂoor plan: 4+BR, teen/ bonus room, executive ofﬁce, generous master with sitting area plus spa bath, tailored gourmet kitchen with lock & key drawers for your special silver. Backyard is totally private with pool/spa, ﬂat grass area & ﬂowering gardens. interior, 4+ bedroom suite, views, custom built in 2010. Never before on market! Best Buy in the Covenant! IN-TOWN PRIVATE CUL-DE-SAC – Rancho Santa Fe single-level home near all: 2 spacious bedrooms, TV den, big ofﬁce, fantastic ﬂoor plan with huge great room & high ceilings. End of culde-sac, .84 acre, beautiful guest house pool and spa. TRADITIONS IN RANCHO SANTA FE! would later win a Nobel Prize for DNA sequencing. During her educational career, sequencing and genomics were relatively new, which made the work that much more intriguing. “It’s always exciting to start in a field when it’s growing or in the very beginning. … Often making a path is much more exciting than following one,” she said. • Clean living close to San Diego’s North County Coast • Open ﬂoorplans & spacious lots, private cul-de-sac street constructed entirely of decorative pavers. • Across from Ada Harris Park! The Kidz Kare participants from the RSF Community Center show the stockings they stuffed for the San Pasqual Academy foster teens. academy. This activity took place at the RSF Community Center. San Pasqual Academy serves 184 foster teens by providing a stable, caring home, quality education and the skills needed for independent living. 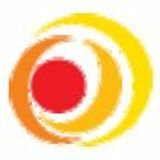 The RSF Community Center is a nonprofit organization that connects Rancho Santa Fe residents and businesses through a variety of programs and services. R. Roger Rowe School to host FTC Robotics League Meet On Saturday, Dec. 10, the R. Roger Rowe School will host an FTC Robotics Tournament in the school gym. Opening ceremonies will be held at 9 a.m. followed by competition. The tournament is expected to end at approximately 1:30 p.m. In addition to three Rowe teams, 14 additional teams from around the region will attend. The public is invited and there is no charge. For more information about the meet, please contact Pamela Meistrell at pmeistrell5464@att.net. The first annual Torrey Pines High School Shoot-a-thon, a girls basketball program fundraiser, will be held Saturday, Dec. 10 in the TPHS gym from 2 p.m.-4 p.m. There will be four divisions to participate in so all ages (even adults) are included. (Divisions: Elementary School, Middle School, High School, Adult.) $5 entry fee per three-point contest (10 shots); $5 entry fee per freethrow contest (10 shots). There will be a prize for the three-point and freethrow shooters that take 1st place (per division). To register, please email tpgirlshoops@gmail.com. Come out and have fun while supporting your Torrey Pines Falcons Basketball Program. The 27th Under Armour Holiday Classic, presented by Torrey Pines High School, is rapidly approaching. Come out and enjoy some great basketball with the family Dec. 27-30. Locations will include Torrey Pines High School, Cathedral Catholic High School, Santa Fe Christian, La Jolla Country Day and El Camino High School. For up-to-date information, please visit theholidayclassic.org. just make her braces and she does all of the hard work.” Hile had been running marathons since 2000, but in 2006 she started getting symptoms that doctors initially misdiagnosed as sports injuries like nerve damage. But after a few months of that, an MRI showed what Hile was truly dealing with. And she met the challenge head on. “Having a neurologist tell me to lower my expectations for running, I just got mad and wanted to prove her wrong,” Hile explained. • You’ve got enough on your plate this time of year: we’ve got this. We build, sell, install and warrant all of our windows; that means there’s no middleman to deal with, and as the replacement window division of Andersen Corporation, we’re as trustworthy as they come. • New windows won’t impact your holiday spending. Why? Because you won’t pay anything until next year. Breathe easier this holiday season with no money down, no payments, and no interest for a whole year. • Improve the design of your home with endless design possibilities. Imagine windows and doors that complement your home’s design aesthetics perfectly. With Renewal by Andersen, there are millions of possible color, frame, and screen combinations. You can even choose to have your window frames one color on the inside of your home and another on the outside. Chabad Jewish Center of RSF presents 10th annual RSF Chanukah Celebration Dec. 27 All are invited to join the Chabad Jewish Center of RSF on Tuesday, Dec. 27 from 5-7 p.m. for a Chanukah Celebration at The Inn at Rancho Santa Fe. A Menorah lighting will be held at 6 p.m. and the event will also include ice skating, live music, Chanukah crafts, Latkes, donuts, hot drinks and more. Special thanks to Dr Bob and Mao Shillman and co-sponsor The Inn at Rancho Santa Fe. RSVP: www.jewishrsf.com. A Menorah lighting will be held at 6 p.m.
being accepted now through Monday, Dec. 19, at any of the following Rancho Santa Fe Fire Protection District fire stations: • Fire Station No. 1: 16936 El Fuego in Rancho Santa Fe • Fire Station No. 2: 16930 Four Gee Road in 4S Ranch •Fire Station No. 3: 6424 El Apajo in Fairbanks Ranch • Fire Station No. 4: 18040 Calle Ambiente in Cielo Directions to the fire stations can be found at www.rsf-fire.org. Welcome to Gelson’s Pharmacy Did you know that as of December 1, CVS will be out of network for Tricare members’ prescriptions? The Rancho Santa Fe Historical Society has received the first “RSF Family Ornament” for its holiday tree. Maggie, Lilly, Amy and Kevin Meier’s family brought an ornament displaying their family name and the date the Meier family moved to the Rancho Santa Fe community to donate to the Rancho Santa Fe Historical Society Holiday tree. The RSF Historical Society hopes to eventually fill its tree with ornaments showing the history of the families that live here in Rancho Santa Fe. What year did your family move here? Jot down your family name and the date you came to Rancho Santa Fe on an ornament for all to see year after year. Ornaments can be brought to the RSF Historical Society now through Jan.4, 2017. The RSF Historical Society is located at the corner of Via de Santa Fe and La Flecha, 6036 La Flecha, Rancho Santa Fe. Please come soon so it can be enjoyed during the whole season. Any questions call 858-756-9291 or visit www.rsfhs.org. Amy and Kevin Meier with daughters Maggie and Lilly. Children can learn to create Chanukah candles at RSF Library Dec. 15 “Chanukah Library Hour and Craft” will be held Thursday, Dec. 15 at 3:30 p.m. at the Rancho Santa Fe Library (17040 Avenida de Acacias, Rancho Santa Fe, 858-756-2512). The event offers children the opportunity to learn about the miracles of Chanukah hands on and create their very own Chanukah candles. Presented by Rabbi Levi Raskin, Chabad Jewish Center of RSF. We welcome all active and retired military members and their families. No or little waiting in lines. Prescriptions by mail available too. *Offer valid at Del Mar, La Costa/Carlsbad, and Pacific Beach only. Excludes pharmacy, dairy, tobacco, bakery, alcohol, gift cards and postage stamps. Cannot be used with any other offer. Limit one coupon per customer per day. No cash back. No reproductions accepted; coupon must be surrendered when tendered. * Selected varieties. Some items are taxable. Prices valid at Gelson's Del Mar, La Costa/ Carlsbad, and Paciﬁc Beach locations only. Thank You, Carmel Valley “I sincerely appreciate all the kindness and conﬁdence shown to me throughout this year. WALK TO SHOPPING & MORE | LIST PRICE $598,000 Charming 2BD, 2½BA unit in desirable, highly sought-out Carmel Valley community offers hardwood ﬂoors, soaring ceilings & more! CUSTOM KITCHEN | LIST $849,000 Beautiful custom remodeled kitchen!! Walk to school & park!! No homeowners fee!! 1BD & BA on main level!! Elevated location!! This exquisite home embodies comfort and charm. Upon your entry, enjoy rich engineered hardwood ﬂoors and spacious living room. Situated in the heart of Carmel Valley this home is conveniently located near shopping, school, dining and more! BRIGHT AND LIGHT | LIST $995,000 Light and Bright home in like-new condition in Paciﬁc Highlands Ranch. Quartz countertops and more!! Tucked away on a private cul-de-sac, this magniﬁcent, custom, home is a unique opportunity to own a 2,664 sq. ft., 1-level home! #1 Individual Agent 2011, 2012, 2013, 2014, 2015 Keller Williams Realty Southern California Region!! In order to help so many families and children, the CRC is depending on the community for volunteers, event sponsorships, cash donations and donations of items such as new toys, new or gently-used bicycles, nonperishable food staples, new or gently-used winter coats and jackets, baby items and more. A wish list is provided at crcncc.org/holidaybaskets. To give, sponsor, volunteer or sign up, please visit the website. Nick Wallace and his TEAM12 lacrosse coach Tom DeMaio. The 26th Annual Christmas Tea and Tree Raffle event will be held at the RSF Library Friday, Dec. 9 from 1:30 p.m.-4:30 p.m. The Dec. 9 event will include holiday creations, music and treats at the RSF Library. Times: 1:30-2:30 p.m., adults only; 2:30-4:30 p.m. all ages welcome; 4 p.m. tree and wreath raffle. Raffle tickets on sale beginning Dec. 5 – $1 each or 12 for $10. Questions? Please contact Susan at 858-756-4780 or visit www.rsflibraryguild.org. Holiday Season surround you and your loved ones today and throughout the New Year. provides ﬁnancial guidance to women and helps plan for their ﬁnancial future and to protect their family legacy. Deborah Sims, Wealth Advisor, Estate Management Group is an independent firm with securities offered through Summit Brokerage Services, Inc., Member FINRA, SIPC. Advisory services offered through Cetera Investment Advisers LLC, a Registered Investment Adviser. Phone (858) 597-1980 | Fax (858) 546-1106 Securities and advisory services offered through Independent Financial Group, LLC (IFG), a registered broker-dealer and investment advisor. Member FINRA/SIPC. IFG and FDL are not afﬁliated entities. Holiday food donation drive for SD refugees to be held Dec 10 at CCA More than 1,000 refugees have arrived in San Diego County since May 2016 due to one of the worst humanitarian disasters in recent history. Refugees are challenged with an overwhelming amount of emotion and anxiety as they arrive. The government-funded resettlement agencies, including the Internation Rescue Committee (IRC), are doing all they can to help these families. During this season of giving, a few local families have put together a food donation drive to help with one of their urgent needs, food. They have requested the dry food items below. Please help in making this donation a success. All items will be donated to the IRC in City Heights. Please drop off your donations on Saturday, Dec. 10 between 8 a.m.-noon at Canyon Crest Academy in front of the Proscenium Theatre. There will be signs where to drop off. Thank you in advance! Dry food items needed: any type of rice, dry beans (lentils), pasta, flour, tea bags, instant coffee. THANKS TO EVERYONE who voted for Dr. Stevens as the Best in North County! Organics” at Whole Foods. There will be more updates in the future on how the RSF Garden Club is contributing to the community, as well as surrounding communities, through charitable horticulture and charitable conservation. The Rancho Santa Fe Garden Club is a 501(c)3 nonprofit organization. Donations are tax deductible. For more information, call 858-756-1554, visit www.rsfgardenclub.org, or email: erin@rsfgardenclub.org. Located in The Bridges, this luxurious architectural gem meticulously constructed, takes advantage of mesmerizing golf, mountain and stunning clubhouse views. Situated at the end of a peaceful cul-de-sac on a superb 1.33 acre lot, one is surrounded by the peacefulness and beauty of the lush and mature landscape. Stunning custom designed features and materials throughout. Gated and set far back from the street for privacy and seclusion, a long drive lined by mature landscape and gardens leads to the estates motor court and stately façade. Grand-scale single–story interiors featuring, stone floors, soaring ceilings, wood beams and spectacular finishes. Sweeping canyon and mountain views. Outdoor living/dining room, pool and spa. Natural gas, sewer, high speed internet. ated in the Covenant of Rancho Santa Fe. Set behind ibe surrounded by mature landscape. Truly embodying eamless open floor plan and amazing indoor/outdoor pa, waterfalls, outdoor kitchen, fireplace, and fire pit. senior Sawyer Lebert and 5’9” senior Edan Abed both saw ample playing time last year and seniors 6’1” Daniel Frost and 6’0” David D’Lima also return and will be contributors. Three outstanding newcomers are expected to make major contributions, including 6’4” senior transfer from Torrey Pines High School Jakob Travis, 5’ 10” junior transfer from La Costa Canyon High School Sam Crespy, and 6’1” freshman Frank Gelfman. The Ravens open their season at the Hilltop Tournament and also compete in the TPHS Under Armor Holiday Classic and the Orange Glenn Tip Off Classic before they begin league play in January. RSF Attack B98 Academy team wins SCDSL Championship The RSF Attack B98 Academy Soccer team, coached by Malcolm Tovey, is the champion of the Southern California Development Soccer League for 2016. The SCDSL is one of the most competitive soccer leagues in the country, drawing top teams from Los Angeles, Ventura County, Orange County, and San Diego. The Attack team, comprised of boys born in 1998 and 1999, claimed the title in the league's highest and most competitive division. CCA Boys Varsity Basketball team. •14049 Ventura Blvd - Sherman Oaks •9616 W. Pico Blvd. - Los Angeles •8657 Villa La Jolla Drive - La Jolla •22333 Sherman Way - Canoga Park Not available at all stores, limited to quantities on hand. ©Copyright 2016 by Ralphs Grocery Company. All Rights Reserved, Ralphs CARD prices may remain in effect longer than the time period indicated. We reserve the right to correct all printed errors. All items may not be available at all stores. We reserve the right to limit quantities for retail sales only while supplies last. Prices may vary depending upon local competition, cost factors of geographic location. Manufacturer’s coupons will be redeemed at face value. Applicable sales tax will be charged on Manufacturer’s coupons. We reserve the right to accept, limit or refuse manufacturer’s coupons issued by other Supermarkets. Minimum card savings shown, check store shelf price tag for actual savings. All Buy One Get One Free items are taken from regular shelf retail. Rewards excludes alcohol, tobacco, money orders, postage stamps, gift cards/certiﬁcates, lottery, promotional tickets, tax, CRV, ﬂuid milk products, fuel, pharmacy and all other purchases prohibited by law. Letters Policy Topical letters to the editor are encouraged. Submissions should include a full name, address, e-mail address (if available) and a telephone number for verification purposes. We do not publish anonymous letters and there are length limits (about 450 words maximum). E-mailed submissions are preferred to editor@rsfreview.com. Letters may be edited. The letters/columns published are the author’s opinion only and do not reflect the opinion of this newspaper. 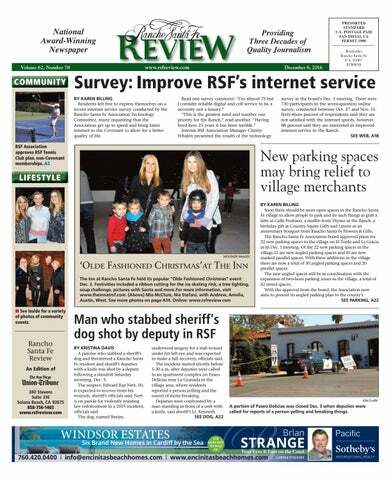 OUR READERS WRITE rsfreview.com Rancho Santa Fe Review is published every Friday by Union-Tribune Community Press. Copyright © 2016 Union-Tribune Community Press. No part of the contents of this publication may be reproduced in any medium, including print and electronic media, without the expressed written consent of Union-Tribune Community Press. Subscriptions available for $125 per year by mail. Dec. 3 Felony assault-6000 block of Paseo Delicias, 5:42 a.m. Assault-8100 block of Artesian Road, 9:15 a.m.
Sotheby’s Patio is located at 16236 San Dieguito Road, Rancho Santa Fe, 92067. Please RSVP to Lauren (951) 892-2398 or by email: lauren@smartmortgageteam.com. Founded in 1995 to honor the memory of brave little hero, Conner Champ, Conner’s Cause for Children is a one-of-a-kind organization that offers direct financial assistance to local families for a variety of out-of-pocket medical and non-medical costs related to the care of a child with a life-threatening illness or injury. All proceeds from “Sip and Wrap” go directly to Conner’s Cause families to help ensure their children have access to medical care and basic needs, as well as a little something extra to brighten their holidays. For information on how to donate, participate in or sponsor this event, please contact Carol Del Signore at 760-487-1592, carol@connerscause.org. If you are unable to attend but would like to donate, please go to www.connerscause.org. East Coast-based jockey Javier Castellano and Annals of Time celebrate their win at Del Mar in the Grade I, $300,000 Hollywood Derby Dec. 3. Annals of Time wins Grade I, $300,000 Hollywood Derby East Coast-based jockey Javier Castellano (pictured) and trainer Chad Brown both notched their first stakes wins at Del Mar in the Grade I, $300,000 Hollywood Derby on Saturday, Dec. 3. Castellano piloted Annals of Time to a 1 1/2-length victory over stablemate Beach Patrol. Long shot Frank Conversation rounded out the top three in the field of a dozen 3-year-olds. Annals of Time – owned by Klaravich Stables Inc. and William H. Lawrence – completed the 1 1/8 miles on the grass in 1:47.73. “I give Mr. Brown all the credit for shipping out a young horse like this – a horse making only his fourth start – and shipping him to the West Coast and having him ready to run a race like this,” Castellano said. “He was powerful. When I asked him in the stretch, he put in a powerful kick. Very strong; very impressive. And he galloped out strong and straight. Distance will be no problem with him.” The other stakes on Saturday’s card, the Grade II, $200,000 Bayakoa Handicap, was won by the favorite, Vale Dori. On Sunday, which marked the end of the Bing Crosby season, Miss Temple City triumphed in the Grade I, $300,000 Matriarch Stakes. Norberto Arroyo Jr. clinched his first riding championship in Southern California, with 12 first-place finishes during the 15-day meet. Peter Miller won his second fall Bing Crosby meeting training title, with 16 victories. Racing at Del Mar will resume on Wed., July 19. Experience 53 competitive middle and high school teams, a stateof-the-art athletic center and a dedicated full-time athletics staff. Kids will have the opportunity to participate in several creative holiday events at the RSF Children’s Library. more, and positive include exercise, sleep, ingestion of omega-3s and more. likelihood of chronic diseases, such as certain types of cancer and cardiovascular diseases. “We know when the telomeres run down enough, they cannot make a protective cap at the end of the chromosome, which sends a strong signal to cells and they do not multiply. And when cells don’t multiply, tissues don’t replenish,” she said. “Over a lifetime of say eight decades, the telomeres dwindle down due to the incomplete copying and are damaged by things like chemicals. It happens to all of us in our lives. So the question became: Does this matter?” A study of 64,000 people would later suggest it does. For the study, Blackburn and associates measured telomere length and then waited seven years. At the end of that seven years, they looked at who died and why. The people with the shorter telomeres were more likely to die rather than those with longer ones. Larger studies are underway as to what to do when people discover they have short telomere length. Right off I-15 and CA -78. Only 30 min from downtown SD / La Jolla. Free parking. FROM DOG, A1 Nelson. Deputies launched pepper balls at Nett and deployed a sheriff’s dog to subdue him, but he attacked the dog, Nelson said. Deputies rescued Banjer and rushed him to an animal hospital for emergency surgery. Banjer was wearing a safety vest when attacked. Authorities later tweeted a photo of the dog, with several stitches below his eye and wearing a recovery cone around his head. After attacking the dog, Nett broke into a nearby apartment and held a resident at knifepoint, Nelson said. The victim was able to escape and run into a bathroom, locking the door. The suspect then yelled to deputies posted outside that he’d just “slit the throat” of the victim, Nelson said. As deputies prepared to enter the apartment to rescue the resident, Nett stepped outside again and confronted them with the knife, Nelson said. One of the deputies fired four shots, striking Nett in the torso. They treated him at the scene until paramedics arrived and took him to a hospital. The deputy who opened fire was not named. The deputies who responded to the incident were not injured. The resident was found inside the bathroom unharmed. Hile ran half-marathons at an 8:20 pace. “Now I’m definitely much slower but I’m just happy I can keep running with MS, because it can stop you from moving at all,” Hile explained. “I’m hoping when I finally do stop running marathons, it will be on my own terms, not because I have MS.” Hile grew up in Orange County, but has lived in San Diego since coming to UC San Diego in 1995 (except for a brief stint in Seattle from 2010-2013 during which she still came back to San Diego to have Mirzaian make her AFOs). Back then, Mirzaian had a small local practice in La Jolla, which was bought out by the Hanger, Inc — a huge national prosthetic and orthotic company — in 2012. That’s when he moved to the office in Encinitas, where his practice is booming. Born and raised in Glendale, Mirzaian came to North County in 1987 and never moved back. He attended San Diego State to be a dietitian, but got into orthotics after an injury to his knee that was supposed to keep him away from snowboarding and surfing for a year or two. A brace that was made for him allowed him to get back to those activities much sooner, and that inspired him to get into the field, so he went back to school, got certified and has been doing this work since 1992. “Not too many people know about this field and it’s really growing,” said Mirzaian, whose wife, Donna, has taught at La Costa Heights Elementary in Encinitas since 1995. They have three kids who went through the Encinitas Union School District and are now seventh, ninth and 12th graders in the San Dieguito Union High School District. After Mirzaian examines a patient, he orders the orthotic to be made in a factory based on his specifications, then he does little adjustments himself to make sure the piece fits and works correctly. For Hile’s AFO, that means cutting pieces down and creating a pad. Hanger — which is famous in part for helping athletes with lost or malfunctioning limbs achieve lofty goals and also for creating the prosthetic tail for Winter, the dolphin who is the subject of the movie “Dolphin Tale” — has helped make Hile’s seven in seven goal a reality, sponsoring her trip to Antarctica, among other things. Opportunity of a Lifetime Magniﬁcent bay front in Coronado! Constant change and excitement out of almost every room in this amazing property. Over 5600 sq. ft situated discreetly off of 1st St, home has minimal maintenance and maximum enjoyment! Exquisite ﬁnishes with artistic use of stone, bronze and custom glass. Elevator services all 3 ﬂoors with one bdrm on entry level. 3 car garage plus small boat garage on bay side with ramp and gate to access bay from your own home. Whether you have been naughty or nice, enjoy the holidays in your new home at The Crosby!! Experience the feeling of a destination vacation every day in this immaculate former model home. Elevated on a corner lot on a cul de sac street on one of the highest elevations in the Crosby Estates, the property features 4 bedrooms, including the sumptuous Master suite with fabulous terrace offering panoramic and peak ocean views. Road Less Traveled Built by famed artist Clay Walker, this site was chosen for its 360-degree views and built to compliment its terrain and bring peace and harmony for those who dwell here. Situated on the pinnacle of almost 8 acres, this home totals just over 3000 sq. ft. including a 3 bd/3ba main house, 1 bd/1 ba guest house and a detached ofﬁce. A family compound with putting green, room for horses, meandering walkways with stone patios to enjoy 360 degree views and warm breezes on a lazy day. Lake Hodges Country Living Don’t miss this rare opportunity to get back to country living! Enjoy unobstructed lake views from the decks of TWO darling homes & a massive sun-kissed lot that will allow you to pursue your passion closer to the coast than anywhere else in North County San Diego. What is it your heart & soul are longing for: horses, garden, orchard, vineyard. Luxuriously appointed main home of approx 1,600sf & a timeless 1940’s cabin of approx 800sf w/ an additional living space below & a HUGE fully irrigated empty lot. ALL of this is less than 10 miles from the beach in Del Mar. Breakfast in Bethlehem at the Village Church in 2015.
powerful rendition of the Christmas story through song. Tickets online at sdproartevoices.org. On Christmas Eve, four different worship services will fill the sanctuary of the Village Church. “The birth of the Christ child represented hope 2,000 years ago, and that message is just as relevant in our world today. We welcome everyone on Christmas Eve to share with us the message of faith and redemption that Christ brought to all humanity,” explained the Rev. Dr. Jack Baca, senior pastor of the Village Church. All activities will take place on the campus of the Village Church located at 6225 Paseo Delicias, Rancho Santa Fe, Calif. 92067. For more information and directions visit villagechurch.org. ON VIEW THROUGH JANUARY 2, 2017 The Uses of Photography examines a constellation of artists who were based in San Diego between the late 1960s and the mid-1980s and whose experiments with photography opened the medium to a profusion of new strategies and subjects. These artists sought artistic media and formats adequate to address their turbulent era and its pressing questions. Martha Rosler, Boys’ Room from House Beautiful: Bringing the War Home, c. 1967–72, photomontage. Courtesy of the artist and Mitchell-Innes & Nash, New York. Light up the Holiday Season with Creatures that Glow! December 15: 6-9 p.m.
Join us in our “Little Shop Around the Corner,” during library hours: 10 a.m.–5:30 p.m., Tue–Sat; until 8:30 p.m., Wed. Browse our much-loved “shop” for great gift ideas— gently used books, vinyl LPs, and CDs, plus great artwork—at bargain prices in a peacefully pleasant place. Through his parents’ inspirational story, local man hopes to help heal divisions BY JOE TASH Martin Kent is a man on a mission – to spread what he calls a “universal message of tolerance.” The 65-year-old Encinitas resident, a retired documentary filmmaker and journalist, said he seriously considered moving to Canada after the election of Donald Trump as president in November. The son of Holocaust survivors, Kent said he was disturbed by the polarization that arose during the election campaign. But conversations with his two grown sons changed his mind about leaving – one asked him, “What will that accomplish?” Kent recalled. Instead, said Kent, he wants to revive a talk that he has given in the past to high school students in Los Angeles, where he lived before moving to San Diego County four years ago. The hour-long program, he said, will encourage students to speak out when they witness acts of intolerance. “Do the right thing. Don’t be silent because your life ends when you remain silent. It’s over,” Kent said, paraphrasing a favorite quotation from the Rev. Martin Luther King Jr. Kent said he hopes to reach out to local school districts with his offer to provide the presentation, which includes a segment of a documentary video he made about his parents’ story. His father, Jack, a young Catholic man, and his mother, Roza, a Jewish woman, met during the Nazi occupation of Poland in the 1940s. The two went on the run from the Nazis, narrowly escaping imprisonment and death at the hands of the occupiers, Kent said. “He could have easily walked away,” said Kent, rather than helping the young Jewish woman. Instead, “He put his life on the line and saved her.” In 2003, the government of Israel recognized his father’s actions with its highest honor, the “Righteous Among the Nations” award, the same award given to Oskar Schindler, the businessman memorialized in the film “Schindler’s List” for saving the lives of Jews during the Holocaust, said Kent. Kent said that since the election, he has been dismayed to read of the rise of intolerant acts aimed at minorities, including Muslims, Jews, Hispanics and others. The problem, he said, seems particularly acute in the nation’s schools. He pointed to a survey of K-12 educators conducted after the election by the Southern Poverty Law Center, an anti-discrimination group. According to a report on the group’s web site, 80 percent of teachers, administrators and school staff surveyed indicated heightened anxiety among students, worried about impacts of the election on themselves and their families. “Also on the upswing: verbal harassment, the use of slurs and derogatory language, and disturbing incidents involving swastikas, Nazi salutes and Confederate flags,” said the report. Against Hunger in Haiti,” more than 500 volunteers assembled food packages into meals. Food packages will be distributed to Shepherd’s House, a Haitian children’s orphanage and over 200 families who lost their homes in the hurricane. SFC was joined in food packing efforts by students from King/Chavez Primary Academy and employees from the American Heart Association and Lombardi Group. “Events like these provide our students with an opportunity to not only learn about the needs that exist in this world, but to also understand how they can be part of the solution,” said Dr. Tom Bennett, Head of Schools for Santa Fe Christian Schools. Visit www.sfcs.net. Packing meals are (l-r) Zachary Nixon, Elizabeth Carroll, Sofia Bianchi, Chloe Hutchinson, Cynthia Nixon and Kanaan Hendren. Self-Serve Yogurt, Gelato, Sorbet, and Custards! Breakfast Served All Day! T H E H O L I DAYS A R E H E R E! EVENT BRIEFS ‘Dashing through the Snow’ concert The North Coast Symphony Orchestra, directed by Daniel Swem, will perform “Dashing through the Snow” on Saturday, Dec. 10, at 2:30 p.m. at the Encinitas Community Center, 1140 Oakcrest Park Dr, Encinitas, at corner of Encinitas Blvd and Balour Drive. The concert features special holiday selections including “Tintinabulations,” “A Christmas Festival,” “The Bells of Cristmas,” “Fantasia on Greensleeves” and much more. Tables will be available for picnicking. Tickets available at the door: $10 general, $8 seniors/students/military, $25/family max. For more information, visit www.northcoastsymphony.com. The orchestra is funded in part by the City of Encinitas and the Mizel Family Foundation. Theater •Plot: A community group gathers for its annual radio-show performance of Charles Dickens’ famous story, but will the actor playing Scrooge make it in time, and can the troupe pull it off, despite the bad weather? Come and find out at “A Christmas Carol: A Classic Radio Play” from La Jolla Theatre Ensemble’s Matt Thompson, 7 p.m. Tuesday, Dec. 20 and Wednesday, Dec. 21, La Jolla Community Center, 6811 La Jolla. Blvd. The Thai Cashew Quinoa from Flower Child. sun-dried olive, sunflower seeds and topped with a lemon tahini vinaigrette. Proteins of all natural-chicken, sustainable salmon, grass-fed steak and organic, non-GMO tofu can be added to any salad or bowl. There are tasty gluten-free desserts and to drink there is a selection of teas and seasonal lemonades like organic apple cider ginger lemonade, kombucha on tap, organic wine and local beers. Weekend breakfast starts at 8 a.m., and includes items such as a quinoa breakfast burrito, spiced maple porridge, along with morning beverages, including the Liquid Sunshine (coconut water, carrot, orange, ginger, and turmeric). Flower Child Del Mar is located at 2690 Via De La Valle. For more information, visit iamaflowerchild.com or call (858) 314-6818. Flower Child is now open at Flower Hill Promenade. The cheery lower level dining room at Flower Child. Beethoven’s greatest work will thrill you with its grandness of scale and rousing chorus! Hearing this music live will be an experience you’ll never forget. Featuring the San Diego Master Chorale. Edo de Waart conducts. Chanticleer has been known around the world for almost four decades as “an orchestra of voices” for the Every holiday season one show seamless blend of its twelve stands out above the rest, and male voices. The first vocal this year, that show is Broadway ensemble voted into the star Brian Stokes Mitchell American Classical Music performing with the San Diego Hall of Fame will bring a Symphony in a concert featuring festive holiday program to your favorite Christmas music! San Diego. Don’t miss this beautiful event, guaranteed to make you smile *San Diego Symphony Orchestra does not appear. and warm your heart. Our camps are designed for players of all ages to come out and have fun, but to also work to improve their technical abili!es. Games such as soccer tennis and small-sided scrimmages are used as tools to work on individual skills, speed, agility and shoo!ng. Camp sessions will be conducted by Director of Coaching Malcolm Tovey and his staﬀ of professional coaches. Carrying on Family Traditions & Recipes for Over 100 Years! Specialty Italian market with imported Italian foods and wine! Medium salad feeds 10-12. Offer expires 12/31/16. Not valid with other offers or discounts. Celebrate the holidays with a Cannoli! holiday tea honoring the past chairs of the Rady Children’s Hospital Charity Ball was held Dec. 1. Called “A Victorian Christmas,” the event was held in the Hansen Mansion, which is a very large 1898 house in Coronado. The event was chaired by Bonnie Hage. The 108th Rady Children’s Hospital Charity Ball, “For the Love of a Child,” will be held Feb.11, 2017 at the Hotel del Coronado and will benefit Rady Children’s Peckham Center for Cancer and Blood Disorders. Phyllis Parrish will chair the Feb. 11, 2017 Charity Ball. Visit www.radyfoundation.org/events/our-events/charity-ball Online: www.rsfreview.com. ON THE MENU: HOLIDAY CHEER AND WELCOME THE NEW YEAR WRAP IT UP! December 1, 2, 8, 9, 15, 16, 22, 23 | 11:30 a.m. to 2 p.m. This is the only time during the year The Marine Room is open for lunch – so treat your family, friends and colleagues to a special meal! December 12-14 | 7 to 11 a.m. | $44 per person Before the year ends, treat yourself to an incredible buffet and experience nature in action! Saturday, December 24, 5 to 10 p.m. | Sunday, December 25, 12 to 7 p.m. Enjoy a Christmas Eve or Christmas Day meal by the sea and leave the cooking to us! First Seating 5:30 p.m. $95 per person | Second Seating 8:30 p.m. $165 per person Ring in the New Year with a culinary celebration to remember! Our later seating includes an exquisite five-course menu and music from the Whitney Shay Band. Stop by The Shores after your holiday shopping and let us “Wrap It Up.” Receive two complimentary gift wrappings while enjoying lunch or dinner in the dining room. CHRISTMAS EVE DINNER Saturday, December 24 | 5 to 10 p.m.
Indulge your family and friends with our sumptuous à la carte Christmas Eve entrées including Lemon Oil Poached Lobster Tail, Crispy Skin Pacific Snapper and Angus Ribeye Steak. Sunday, December 25 | 9:30 a.m. to 7 p.m. $56 for adults and special pricing for children Give yourself a break from cooking this year with a feast sure to please everyone. Enjoy main courses including Chef Percy’s Seafood Paella and Angus Barron of Beef, traditional sides, a complete children's station, and a Christmas Yule Log for dessert! Tax, beverage, and gratuity, unless otherwise noted, are not included in prices listed. Menu items subject to change. exclusive Covenant at Il Incanto, set among a verdant paradise of rolling lawns, towering trees, koi ponds, and lemon orchards. Designed for year-round enjoyment, er ameni�es, including a single-level, ﬁve-en-suite bedroom main residence, well-appointed and private guest home, as well as complete equestrian facili�es. rringbone wood ﬂoors and Vene�an plaster walls, in addi�on to a modern, open ﬂoorplan, the main home is a warm and invi�ng retreat without compare. Not e outdoor kitchen and ﬁreplace-warmed pa�o, or the new rec�linear pool and spa beyond. Il Incanto truly is the epitome of Southern California living in one of f Bath, 8 Stall Barn, 5 Car Garage, Lot 5+ Acres. FROM THERAPY, B5 provide effective ‘hands-on’ treatment,” he said. “Our physical therapists are trained to not only eliminate your short-term pain, but will work with you to come up with longer-term exercise programs to keep your pain from coming back and optimize your health and function.” Stone said that one of the big changes that has occurred over the past year is that direct access became available January 1, 2015. This allows patients in California to seek care directly from a physical therapist without a physician’s prescription. “There are several reasons that people can benefit from physical therapy,” said Stone. “Physical therapists are excellent at finding the root cause of musculoskeletal problems.” In addition to typically being seen within one or two days, Stone said a comprehensive plan is administered during the first appointment to determine the problem and find the best approach to address it. The business has been recognized as a top physical therapist practice, including a 2016 Readers’ Choice “Best of”award and Best Physical Therapists in San Diego 2016 by Expertise. Gaspar Doctors of Physical Therapy also takes pride in giving back to the surrounding community. This includes supporting many local nonprofit organizations and high school athletic training programs, offering hundreds of free athlete physicals and helping raise money for athletic training scholarships. The business has also been active in raising funds for breast cancer research and will be adopting a family over the holidays to provide food, clothing and gifts for them. “Our company is also different in that many of our clients consistently remark that it is a fun and enjoyable place to be,” said Stone. “We have always strived to maintain customer care and quality service as the number one priority of our practice.” For more information, visit www.gasparpt.com or email info@gasparpt.com. - Business spotlights are developed through this newspaper’s advertising department in support of our advertisers. Botanic Garden of Lights The Botanic Garden is transformed into a dazzling winter wonderland with over 100,000 sparkling lights for a magical holiday experience now through Dec. 23 and Dec. 26-30 at the San Diego Botanic Garden, 230 Quail Gardens Drive. Visit sdbgarden.org/lights.htm. FROM MUSIC, B4 table’. I have seen this process from both sides and can offer students an opportunity to do a dry run of their audition. We can cover everything from what to wear, how to address an accompanist (for singers), how to present yourself and what questions you may be asked should you be interviewed. I would also be happy to share my experiences about what to expect at music school. Pursuing a music degree is a lot harder than most people think and it is important for students to know what they are signing up for. Having said that, I love what I am doing and still can’t believe that I am lucky enough to be able to follow my dreams!” Daniela is offering one-on-one workshops starting mid-December, in time for college auditions in January and February. Daniela also gives acting and voice lessons. Please contact her directly at dcamill2@u.rochester.edu for workshop pricing and availability. It’s always best to have a full budget in mind with plenty of cushion. This is especially true for those taking out a home construction loan. It’s not uncommon for projects to go over budget (this is why we recommend to have a contingency built in between 10% to 15%). An experienced builder will factor in the budget allowances of design elements such as cabinetry, countertops, ﬂooring, and ﬁxtures. However, these allowances do not always account for homes with many custom and high-end features and add-ons. I recommend discussing with your construction team the level of ﬁnishes you expect so they can input the proper allowances for your taste. It would also be smart to provide examples of the quality of work and styles of ﬁnishes you’re expecting. Quality Builders All builders are not of the same quality. Some lower-end builders will have lower allowances to make their bid seem more affordable. What you don’t want is for your builder to skimp on the important foundational and structural elements of your home, compromising the house’s integrity. Tenoré performing at the concert in Rancho Santa Fe. that was for his music career. He also talked about a ‘happy accident’ in his studio that provided the introduction to the hymn “Be Thou My Vision.” They opened their second set with the title song of their latest album, “The Impossible Dream” from Man of La Mancha. Carlos sang solo, Puccini’s classic “Nessun dorma,” which received a long applause. Other highlights included an “a cappella” version of “Down in the River to Pray” from the Coen brothers film, O Brother, Where Art Thou?, “’Til I Hear You Sing” from Love Never Dies, and a passionate and dynamically exuberant rendition of “Mary, Did You Know.” The evening concluded with a story Mark told about surviving a head-on collision with a drunk driver, which broke nearly every bone in his body and took his voice away. Carlos then walked out and sang “Always There,” joined by Mark and David. The audience was brought to tears by these talented and endearing young artists. Tenoré represented magnificent voices, big hearts and a “pay it forward” philosophy. In other words, they gave a perfect Veterans Day concert. Don’t miss the next concert, Melinda Doolittle, Jan. 20, 2017. Remember, Community Concerts is the best party in town! Tickets and short video clips of each concert are available on the website, www.ccrsf.org. 2016 San Diego County Fair wins top awards The 2016 San Diego County Fair once again earned numerous top awards from the International Association of Fairs and Expositions, confirming its leadership and innovation in the fair industry. The announcement was made at the IAFE annual convention and trade show held Nov. 27-Dec. 1 in Las Vegas. The IAFE represents 3,200 fairs throughout the world, providing exhibits, competition and advancing education aimed at the advancement of livestock, horticulture and agriculture. Out of the 18 honors, seven first-place awards for outstanding Agricultural and Competitive programs were awarded to the 2016 San Diego County Fair and the 22nd District Agricultural Association (DAA). Chimney Sweeps, family owned and operated for over 30 years. Every year there are over twenty thousand chimney/ﬁreplace related house ﬁres in the US alone. Losses to homes as a result of chimney ﬁres, leaks, and wind damage exceeds one hundred million dollars annually in the US. CHIMNEY SWEEPS, INC, one of San Diego’s leading chimney repair and maintenance companies, is here to protect you and your home from losses due to structural damage and chimney ﬁres. Family owned and operated and having been in business for over 30 years, Chimney Sweeps, Inc is a fully licensed and insured chimney contracting company (License # 976438) and they are certiﬁed with the National Fireplace Institute and have an A+ rating with the Better Business Bureau. For a limited time, readers of this paper will receive a special discount on our full chimney cleaning and safety inspection package with special attention to chimney water intrusion points in preparation for the raining season. eaturing the theme “Charles Dickens,” the 23rd Annual Gingerbread Structure Competition and Gala took place Nov. 29 throughout the ballroom of the Fairmont Grand Del Mar. The event also included delicacies from many top chefs of San Diego, hand-crafted holiday cocktails, champagne, live and silent auction items, holiday performances and more. Event proceeds support the Epilepsy Foundation of San Diego County. For more information, visit www.GingerbreadCity.org and www.epilepsysandiego.org. Online: www.rsfreview.com. ORIGINAL RETAIL PRICE PER TREE APPLIES. CRANE, IF REQUIRED, IS EXTRA. NOT VALID WITH OTHER OFFERS. SOME RESTRICTIONS APPLY. EXCLUDES PACKAGES & WHOLESALE PRICES. PROFESSIONAL DESIGN! LIMITED TIME OFFER! HURRY...DESIGN APPOINTMENTS FILLING UP FAST! 400 VALUE - FREE WITH THIS AD! James will help you create the perfect assortment of trees, palms, shrubs and more that will not only look amazing, but give your property the unique curb appeal it deserves! James has been fantastic to deal with every step of the way. He oversaw our complete project from start to finish. After completion he still remains in contact with us to make sure everything’s perfect!! 40 ACRES OF MASSIVE, ONE OF A KIND PALMS, DWARF PALMS, TROPICALS & MORE! I-15 Exit Deer Springs Rd. Easet to City Centre then South 1.5 mi. Just $99 delivers any order within 15 miles of nursery. Other areas higher. HOME & GARDEN CAREGIVER HAULING • Alzheimer’s • Parkinson’s • Dementia • All ADL’s Assist in daily living & light housekeeping. fordshire Terrier mix, is looking for a new best friend.This darling girl was brought in by her previous owner and has been melting the hearts of our staff and volunteers ever since. Aside from her undeniable beauty, Ivy is the type of companion who will do anything to make her humans happy. She’s a peoplepleaser who is a little on the shy side but always friendly. Ivy loves to play fetch and is a dependable retriever. She’ll even politely sit and smile for you to throw the ball again. She doesn’t always enjoy having other dogs in her space, and would much rather be surrounded by her humans instead. Meet Ivy at San Diego Humane Society’s Escondido Campus at 3450 E Valley Parkway or by calling 760-888-2275. County. Registered Owners Name(s): a. Harmos Consulting, LLC, 145 Chestnut Avenue, Unit C, Carlsbad, CA 92008, California. This business is conducted by: a Limited Liability Company. The first day of business has not yet started . This statement was filed with Ernest J. Dronenburg, Jr., Recorder / County Clerk of San Diego County on 11/02/2016. Forrest Samuel, CEO. RSF557. Nov. 17, 24, Dec. 1, 8, 2016. SUMMONS (CITACION JUDICIAL) NOTICE TO DEFENDANT (Aviso Al Demandado): COLLATERAL FINANCING GROUP, LLC, a California Limited Liability Company; DISCOVERY SALES, INC., a California Corporation; DISCOVERY BUILDERS, INC., a California Corporation; CAREY HENDRICKSON, as individual; ALBERT SEENO III, an individual; AYMAN SHAHID, an individual and DOES 1 through 20, inclusive. YOU ARE BEING SUED BY PLAINTIFF: (Lo esta demandando el demandante): JOHN SMYRNI, an individual CASE NUMBER: (Numero del Caso): C16-01169 NOTICE! You have been sued. The court may decide against you without you being heard unless you respond within 30 days. Read the information below. DO YOU NEED TO PUBLISH A LEGAL AD? Let Us Help! Fictitious Business Names ! Name Changes ! Lien Sales ! Alcoholic Beverages License ! Petitions for Probate ! Trustee Sales ! Summons - Divorce ! Annual Report ! Non-Responsibility ! Dissolutions of Partnership ! 100 - LEGALPuede NOTICES su respuesta. encontrar estos formularios de la corte y mas informacion en el Centro de Ayuda de las Cortes de California (www.courtinfo. ca.gov/selfhelp/espanol/), en la biblioteca de leyes de su condado o en la corte que le quede mas cerca. Si no puede pagar la cuota de presentacion, pida al secretario de la corte que le de un formulario de exencion de pago de cuotas. Si no presenta su respuesta a tiempo, puede perder el caso por incumpilmiento y la corte le podra quitar su sueldo, dinero y bienes sin mas advertencia. Hay otros requisitos legales Es recommendable que llame a un abogado inmediatamente. Si no conoce a un abogado, pueda llamar a un servicio de remision a abogados. Si no puede pagar a un abogado, es posible que cumpla con los requisitos para obtener servicios legales gratuitos de un programa de servicios legales sin fines de lucro. Puede encontrar estos grupos sin fines de lucro en el sitio web de California Legal Services, (www. lawhelpcalifornia.org), en el Centro de Ayuda de las Cortes de California, (www.sucorte.ca.gov) o poniendose en cantacto con la corte o el colegio de abagados locales. AVISO: por ley, la corte tiene derecho a reclamar las cuotas y los costos exentos por imponer un gravamen sobre cualquier recuperacion de $10,000 o mas de valor recibida mediante un acuerdo o una concesion de arbitraje en un caso de dericho civil. Tiene que pagar el gravamen de la corte antes de que la corte pueda desechar el caso. The name and address of the court is: (El nombre y direccion de la corte es): CONTRA COSTA SUPERIOR COURT 725 Court Street Martinez, CA 94553 The name, address and telephone number of plaintiff’s attorney or plaintiff without attorney is: (El nombre, la direccion y el numero de telefono del abogado del demandante, o del demandante que no tiene abogado, es): John S. Richards Richards Law 261 Hartz Avenue Danville, CA 94526 92-231-8404 DATE (fecha): JUN 20, 2016 Clerk, by (Secretario), WEBER, Deputy (Adjunto) Summons-Ayman Shahid. RSF558 12/1/16, 12/8/16, 12/15/16, 12/22/16. JACK W. SCHWARTZ, JR., ESQ. (SBN #124506) JOHN S. RICHARDS, ESQ. (SBN #249073) RICHARDS LAW 261 Hartz Avenue Danville, CA 94526 Telephone: (925) 231-8104 Facsimile: (925) 231-8109 SUPERIOR COURT OF THE STATE OF CALIFORNIA COUNTY OF CONTRA COSTA UNLIMITED JURISDICTION Case Number: C16-01169 NOTICE OF DAMAGES SOUGHT BY DEFAULT C.C.P. §§425.10, 425.11, 425.115 AND 580 JOHN SMYRNI, an individual, Plaintiff v. COLLATERAL FINANCING GROUP, LLC, a California Limited Liability Company et al. Defendants. NOTICE TO Defendant AYMAN SHAHID (“SHAHID”), Plaintiff JOHN SMYRNI (‘Plaintiff”) reserves the right to seek $450,000.00 (four hundred and fifty thousand dollars and .00 cents) in punitive damages when Plaintiff seeks a judgment in the instant suit filed against you entitled Smyrni v. Collateral Financing Group, LLC et al. Contra Costa Superior Court Case number C16-01169. This notice is being served pursuant to California Code of Civil Procedure §§ Sections 425.10, 425.11, 425.115 and 580. Dated: November 3, 2016 RICHARDS LAW By: JOHN S. RICHARDS Attorneys for Plaintiff John Smyrni RSF559. 12/1/16, 12/8/16, 12/15/16, 12/22/16. is available to all supporters nationwide, expanding the awareness…it is a dream come true. We’re very excited to be launching our store during the holiday season for everyone to take part in giving back with each and every purchase.” The online store includes Shelter to Soldier logo wear for both ladies and gentleman (t-shirts, tank tops, and caps), as well as a variety of logo accessories and gifts (insulated beverage cups, magnets and window clings). Visit www.sheltertosoldier.org for additional information or to purchase items online. ou better watch out! This holiday season, foodies are more discriminating than ever, reading labels judiciously, making healthier choices, buying sustainable and organic ingredients, and painstakingly preparing treasured recipes from scratch (and with love). That also means more stress for everyone, whether you are hosting a holiday event or are an invited guest. To alleviate your gustatory conscience, relieve your anxiety levels, and make your contributions appreciated and memorable, here are some answers to your ticklish questions — both naughty and nice ones. with a raspy acidity, those qualities are ideal for cooking. Cheap wine typically has too much sugar, masking the true flavor profile of the varietal. But that doesn’t mean you need to uncork a bottle of Lafite Rothschild ($560) to pour into your pans. A middle-of-the-road wine between $6 and $10 a bottle is a good compromise. For risotto use a Sauvignon Blanc or Chardonnay; poach fish in light white wine with fresh herbs; chicken pairs well with red Zinfandel, while beef and lamb are best braised with a Merlot or Cabernet Sauvignon. Q. Every Christmas we have dinner at my sister’s home and all the siblings bring their favorite dish. This year she’s insisting on a healthy theme. Unfortunately, my special creations are loaded with butter, cream, sugar and other decadent ingredients. I don’t want to compromise my recipes that everyone loves, but I don’t want to lie either, saying I’ve tweaked them with a healthier twist when I haven’t. Suggestions? A. My suggestion (although it would be more work for you) is to prepare two versions of your favorite dish — your original one with the indulgent ingredients, and a second healthier riff on the first, substituting organic ghee butter, olive or walnut oil for regular butter, coconut or almond cream for cow’s cream, organic honey, sucanat, or coconut sugar for regular sugar, and use fresh berries in a balsamic glaze as a dessert topping. • 1 teaspoon vanilla or almond extract • 1 pound mascarpone cheese • 1/3 cup Confectioners’ sugar • 1 cup assorted fresh berries • Shaved bittersweet chocolate or unsweetened cocoa powder ■ Method: Blend mascarpone cheese, sugar, extract and one tablespoon of espresso until smooth. Set aside. Combine liqueur, rum and coffee. Dip ladyfingers in liquid careful not to make them soggy. Line them in a baking pan then spread a thick layer of cheese on top, alternating and finishing with a cheese layer. Top with berries. Chill. Sprinkle with chocolate of choice. Add dollops of whipped cream if desired. —kitchenshrink@san.rr.com foods, especially fruits and vegetables. Denizens of these “deserts” consequently have poor, unbalanced diets, which often lead to health problems. Bearing gifts of baskets or decorative boxes filled with organic seasonal fruits (apples, tangerines, persimmons, pears), vegetables (roots, squashes, leafy greens), farm products, such as free-range eggs, organic butter, goat cheese, and yogurt, along with whole-wheat bread or some festive home-baked goody, almond butter and preserves would be a lovely blessing for these folks. communicator, and is very approachable,” Branch Manager Liz Piccolomini said. “They know that her team is going to utilize all the technology and resources of our brokerage to help them obtain the home of their dreams.” Raised in a military family, Cynthia has a strong record of assisting service members with their relocation needs. Her positive approach also served her well as a business coach for a real estate motivational firm. Extremely family-oriented, Cynthia is devoted to helping others by volunteering with schools and military-support charities, Leap of Faith, Together Freedom, Girl Scouts, and American Red Cross. To get to know Cynthia and her team, call her at 619-410-1809 mobile, 858-756-7899 office, and cynthiagalicia@bhhscal. com. We joined the Mossy Family today! We love our new 2016 Prius 3 Touring!! Such a smooth ride, I have to give our salesman a huge shout out for helping us through this process and getting us the RIGHT car for our family! Not only was he super knowledgeable about all the bells and whistles, he was a nice guy too. If you care about price & getting the best car go to Mossy! * Actual Mossy Ford customer review. Models used in photo.